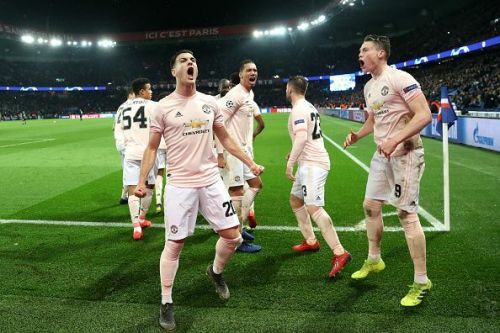 In what could only be deemed as an engrossing encounter between Paris Saint-Germain and Manchester United, Ole Gunnar Solskjaer's men staged a historic performance by beating the French giants 3-1 and advancing to the quarter-finals of the Champions League. A 2-0 defeat in the first leg at the Old Trafford last week, coupled with United missing several first-team stars through injuries and suspensions for the second leg meant that the Red Devils' chances of progressing in the continental tournament looked very bleak. In spite of fielding a second-choice team, and with mainly teenagers to bring on from the bench, United scored twice through Romelu Lukaku in the first-half, with Juan Bernet scoring for PSG in between. 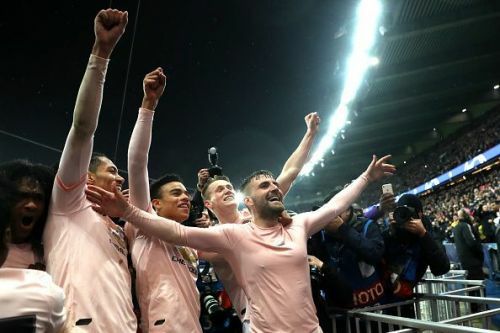 The hosts looked destined to advance to quarter-finals, but United were awarded a controversial penalty, via a VAR decision, in the 91st minute, with Marcus Rashford coolly converting it to crash out PSG. With the English club advancing to the quarter-finals of the Champions League, let's look at Manchester United player ratings. With PSG having a paltry 4 shots on target, De Gea did not have much to do in the match and was not troubled greatly. Moreover, the Spaniard couldn't have done anything to save PSG's first-half goal, which was scored by Bernet. Bailly had an extremely poor game and in fact, his performance was so dull that Solskjaer substituted him for Diogo Dalot in the 36th minute itself. He, along with Ashley Young, was responsible for not being able to close down Bernat which resulted in PSG equalising in the first half. Bailly really needs to pick himself up for the remainder of the season. Smalling was excellent defensively for Manchester United against PSG. Tasked with stopping a fiery Mbappe, he stood tall and was crucial in nullifying the PSG forwards. As for his statistics, he made seven clearances, blocked two shots and intercepted three times. To conclude, while Lukaku and Rashford are getting plaudits for the historic win, Smalling was equally crucial in sending United to the quarter-finals of the Champions League. Like his partner Smalling, Lindelof too was excellent defensively and even initiated a lot of counter-attacks. He continued his resurgent form and guided United to a victory the fans are never going to forget. Starting as a right wing-back, the United skipper had a really poor game. He allowed a lot of space for the PSG attackers and was also, along with Bailly, responsible for Bernat's goal in the first half. Moreover, he wasn't a threat going forward as well. To sum up, Young quickly needs to up his game as an exciting Dalot is waiting to break into the starting line-up. Starting as a left wing-back, Shaw had a really good game defensively as he dealt with the likes of Julain Draxler and Dani Alves very well. Although he could not go forward as much as he would have liked due to the constant attacks of PSG, Shaw still had a decent game and ensured that United were not left exposed by PSG's attackers. Tasked with stopping PSG from running riots in the midfield, McTominay did exceedingly well. He successfully marked Marco Verratti and Bernat and stopped them from gaining control in the middle of the park. With three tackles and six duels won, McTominay ensured that United didn't miss Nemanja Matic. Starting in the middle of the midfield, Fred put in an extremely energetic performance and was really impressive. Fred was crucial in closing down the PSG midfielders and his energy and perseverance resulted in the hosts not being able to create any clear-cut chances. Moreover, he was equally important in attacks also as he was the one initiating the counter-attacks and was also linking the midfield with the attacks very well. As for his statistics, he had seven successful long balls, won five duels and an extremely plausible three tackles. All in all, Fred showed glimpses of how he used to play for Shakhtar and this might be just the game which brings his Manchester United career back on track. Pereira couldn't replicate the form he showed against Southampton and was disappointing for United. Starting as an attacking midfielder, Pereira was expected to create goalscoring opportunities for Rashford and Lukaku up front, but he failed to do that properly. Although he did track back to help his teammates, he couldn't really impose himself as the PSG players easily swept past him. Overall, it was a disappointing game for the youngster. Although the young striker didn't have a telling impact in the game, Rashford did convert an extremely crucial penalty coolly in stoppage time to send United to the quarter-finals of the Champions League. Moreover, Lukaku scored his second goal after Buffon failed to properly deal with Rashford's effort from distance. On the other hand, the last-gasp goal from the spot can't hide the fact that Rashford was often wasteful and ineffective for the Red Devils in Paris. But he got the job done for United in the end. From the very beginning of the game, Lukaku was fired up and looked extremely sharp. His strength and constant pressing resulted in United scoring a goal very early in the game. Moreover, Lukaku was very quick to react after Buffon failed to collect Rashford's effort. He was extremely clinical in the game and his goals played a crucial role in sending United to the next round. To conclude, Lukaku continued his impressive form and is the 'man of the match' for this game. Dalot came on for Bailly in the 36th minute itself and his arrival resulted in United switching to the 4-2-3-1 formation. He brought much-needed pace and directness to United's game. Also, it was his shot in stoppage-time which resulted in a penalty being awarded to United. To sum up, with his impressive performances of late and Young's dip in form, Dalot can expect more game time in the coming matches. Both the youngsters came on too late to have any considerable impact on the game. Champions League 2018-19: Are Manchester United favorites to win the game against PSG?